Guns made for kids: How young is too young to shoot? 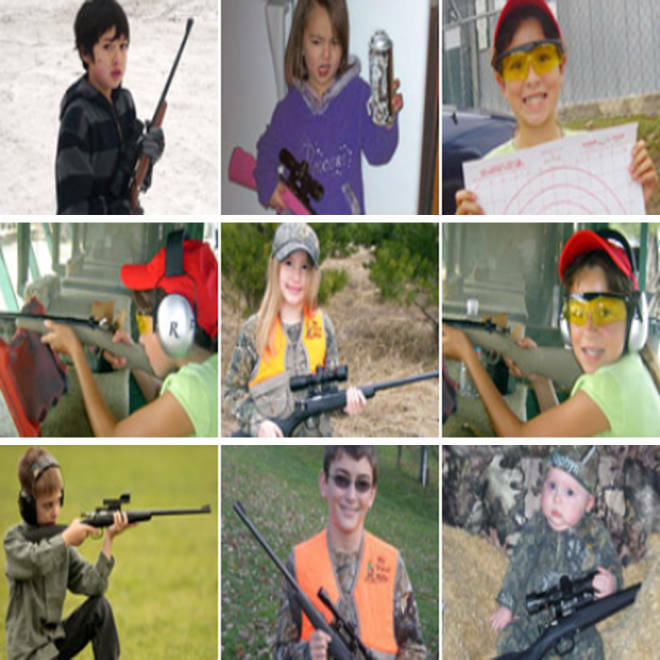 Young target shooters and hunters pose with their guns on the "Kids Corner" web page of Crickett, a line of rifles made for kids. The toddler was shot when the boy was playing with the rifle, as Kentucky state police said in a statement. The gun, a type of rifle made specifically for kids, had been given to the boy as a gift last year and kept in a corner, and the family did not realize a shell was in the chamber, Cumberland County Coroner Gary White told the Lexington Herald-Leader. The Crickett is one of two lines of .22-caliber rifles for kids manufactured by the Pennsylvania-based Keystone Sporting Arms. The company acquired the maker of the similar Chipmunk rifle in 2007, a purchase that positioned the company as “the leading rifle supplier in the youth market,” according to the company’s website. On the site’s “Kids Corner,” young target shooters and hunters pose with their guns, and videos on the company’s YouTube channel promote the gun as fun for the whole family. Keystone Sporting Arms, which says on its website that it made 60,000 rifles in 2008, did not return requests for comment from NBC News. 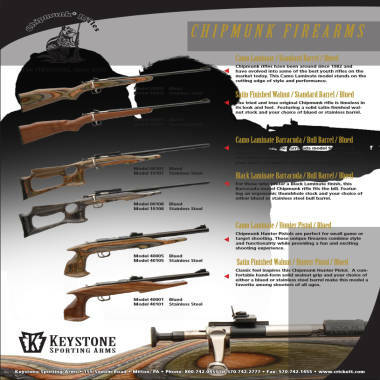 Pennsylvania-based Keystone Sporting Arms manufactures and markets rifles for children. They are "the leading rifle supplier in the youth market," according to the company's website. Yet despite the availability of triggers for tiny fingers, gun makers and marketers are hesitant to actually spell out what age a child should be before handling his or her first firearm, said Sugarmann. Crickett's website, for instance, makes no references to appropriate age ranges for their child-sized weapons. “There’s a recognition that the majority of the American public has concerns about putting guns in the hands of children,” he said. Through studies and promotional materials, some sporting associations encourage young people to take up hunting and shooting as recreational activities, and point to potential benefits -- both for avid gun-owners and youths themselves -- of young people handling firearms. A study conducted on behalf of the Hunting Heritage Trust and the National Shooting Sports Foundation in January 2012 asked young people ages 8 to 17 about how they viewed hunting and target shooting. A 385-page report on the telephone survey said the results were clear: Young people who were exposed to hunting and shooting were more likely to have a positive view of those activities. “Junior Shooters” covers the recreational use of firearms by young people, publishing about two or three issues a year since 2007. Available for download online, the magazine features articles written by adults as well as shooters as young as 10, alongside ads from firearms makers including Glock and Heckler & Koch. “The perspective is you can be involved in the shooting sports, you can have a gun, you can have a career, you can go to the Olympics, you can represent the United States, and you can still do it safely,” said editor-in-chief Andy Fink. The magazine prints about 30,000 copies per issue, Fink said. Under federal law, children under 18 cannot buy guns themselves. Regulations on how children access firearms and who can be held negligent for a child’s use of a gun is left to the states, said Lindsay Nichols, attorney at the Law Center to Prevent Gun Violence. “Kentucky has certain laws to prevent children from gaining access to handguns, but those laws don’t apply to rifles or shotguns,” Nichols said. The mother of the two young Kentucky children was home when the shooting happened and had stepped outside for a minute when she heard the soft pop of the fatal gunshot, said Kentucky State Police spokesman TFC Billy Gregory. “Federal law prohibits the sale of a gun to anyone under 18, so that means that the child couldn’t be the actual purchaser, but you could, and it’s completely legal, for an adult to buy a gun for a child as a gift,” said Nichols. The adult purchaser would undergo a background check if the gun is bought from a federally licensed firearms dealer, such as at a gun store. In its spring 2012 edition, “Junior Shooter” ran a separate NSSF-backed report that claimed that “hunting with firearms is one of the safest recreational activities in America.” The report said that a person is 11 times more likely to be injured playing volleyball and 34 times more likely to be injured skateboarding than hunting. Almost 1,500 children under the age of 18 die every year as a result of shootings, according to the Center for Injury Research and Policy at Nationwide Children’s Hospital in Columbus, Ohio. National statistics on how many young people are shot a year are often unreliable, said Daniel Webster of the John Hopkins Center for Gun Policy and Research, due to state-by-state differences in how shooting incidents are reported. It is “a little premature” to say whether charges will be pressed in the death of the young Kentucky girl, state police spokesman Gregory said. The investigation remains open.